The historic landscape area of Broughton Bay and Whiteford Sands represents an area of inter-tidal beach between Whiteford Point Lighthouse and Spaniard Rocks. The name Whiteford is considered to derive from the Danish 'Hvit-Fford'. The northern boundary runs along the limit of the sand and shingle bank upon which a lighthouse is situated. Elsewhere the area is bounded by the mean low and mean high water marks depicted on the OS 1:10,000 map. A few prehistoric finds have been made along the beach; these mostly comprise animal remains. Evidence of fishing during the medieval period is found in the form of a fish weir (00913w) on Whiteford Sands; however, it is likely that people exploited this resource from a much earlier period. Fishing in the area has continued until the present day, a fish trap (03032w) of relatively recent date was discovered between Whiteford Point and the lighthouse. The Gower coast has strong maritime connections and a number of legends associated with seafaring and piracy. This area of the coast was treacherous for vessels and a large number of ships were wrecked at Broughton Bay and Whiteford Sands. Vessels were still able to anchor in the bay until it became too silted with estuarine sands in the mid-nineteenth century (Edmunds 1979). More than 30 known ship wrecks have been identified, the earliest being the Two Sisters, wrecked in 1804, however, tales of gold doubloons discovered around 1770 in the rocks near Blue Pool Bay give an indication of much earlier ship wrecks along the shore. The biggest known disaster is that of January 22nd 1868 when 16 ships out of a fleet of 19 sailing out of Llanelli, sunk in a single night and possibly up to 30 or more lives were lost (Edmunds 1979). Direct evidence of wrecks survives in a large buoy and chain and also the remains of a wooden hull near Whiteford Point (03033w). The last known wreck on this stretch of coastline is that of the SS Evangeline, which was driven ashore in bad weather in 1904, however, it was not badly damaged. The cast iron lighthouse at Whiteford Point, a listed/scheduled structure (SAM GM407; LB 22885 II*) is a prominent landscape feature. The Llanelli Harbour and Burry Navigation Commissioners constructed the lighthouse in 1865 to mark the south side of the channel to the port of Llanelli; it replaced an earlier wooden structure of 1854. Whiteford is thought to be the only remaining major cast-iron lighthouse in the British Isles, and is an important example of nineteenth century engineering construction. The lighthouse remained in use until 1933; more recently the Nature Conservancy Council took up the lease from the Llanelli Harbour Trust. During World War II the Burry Estuary was used by the army as a firing range. 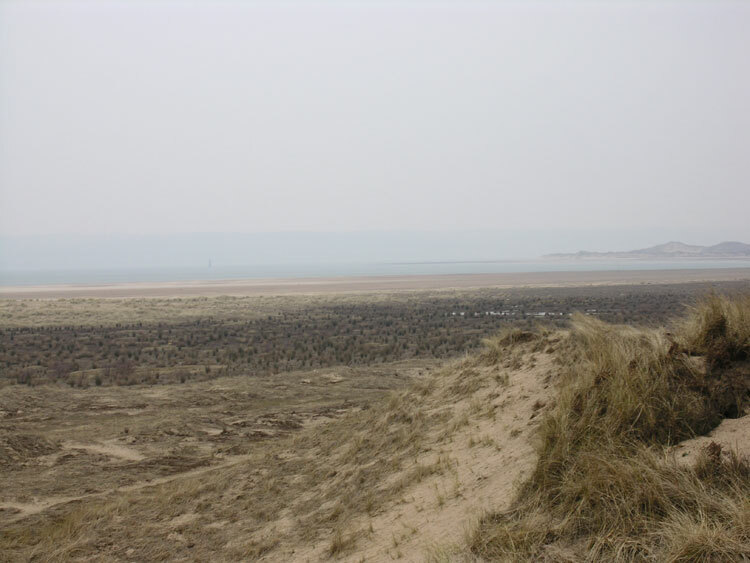 It is reported that many unexploded shells have been found at Whiteford Sands, although the frequency of discovery has been less in recent years.